I have been making these for some time, they are quite simple, but they do take some preparation time and you need to make sure you have prepared for more children than will turn up, because whipping up another at the last minute isn’t straightforward. Before we start, I must mention it couldn’t have been completed without the artwork of Martin Young at bible cartoons. though it does work with bigger bottles. Generally, the straighter the sides are the better. Wrap the cut edge in tape. The plastic looks neater and it covers the sharp edges. Use the hole punch to make 2 holes on either side for the handle. If you have a single hole punch this is much easier to handle, or an awl would work too. Through these holes you need to tie on the ribbon to form a handle. Double knot the ribbon round the plastic, don’t use a big knot hoping it will hold as the knot will get tighter and come loose. Now you have your lantern you need something to go inside. The light passes through paper and tissue paper easily. The effect is produced by having a window cut into the paper decreasing the layers and so giving more light in places. A sheet of A4 folded in half will fit inside the bottle with a bit sticking out. You need to trim the excess according to you bottle size. Place your outside image on one half of the paper and your window on the other half. I made my window the shape of a pool of light. I removed the background of the image too. Print out your image and then trace where you want your light on a separate sheet. Tissue paper in the window will give a coloured effect. Sandwich tissue paper to add colour. The photographed example had thin strips of colour, some children had more of a patchwork effect. The darker the colour the harder it is for light to pass through. 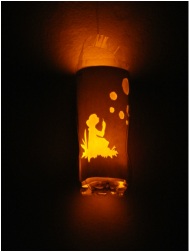 Finally slip the rolled up paper back in the bottle, turn on an electric tea-light candle and drop it into the bottom. It’s hard to photograph but it really is effective. I’d recommend a dark spot for the kids to test it out in if that’s possible! I saw this and though it would be a nice way of showing the nativity. The star would be brightest in the “sky” but streams of light could come down on Jesus in the manger. I like the idea Cindy, would be easy to do with layers of paper, I’ll add it to the list of possible crafts to add a template for. Thanks for the share. This is just what I need for my Sunday School! Are you able to e-mail a copy of the original to me, Kate? E-mail is on it’s way! I don’t see how to get the “Saul on the road to Damascus (PDF)” on this page. Thanks for all you have done with these crafts and images for those of us who are drawing-impaired – LOL! I’m glad you find them useful Jan. The post has been changed, that was an oversight on my part, the original pdf uses Martins artwork and so can’t be shared for copyright reasons. I’ve e-mailed you a copy of the original.